Mamma Mia! (2008) Mamma Mia! Amanda Seyfried, Stellan Skarsgård, Pierce Brosnan, Nancy Baldwin, Colin Firth, Heather Emmanuel, Colin Davis, Rachel McDowall, Ashley Lilley, Meryl Streep, Julie Walters, Christine Baranski, Ricardo Montez, Mia Soteriou, Enzo Squillino Jr.
Meryl Streep leads an all-star cast in the feature-film adaptation of the beloved musical that has been seen by more than 30 million people in 160 cities and 8 languages around the world. Bringing the timeless lyrics and melodies of iconic super group ABBA to movie audiences, Summer 2008 is the season for Mamma Mia! The three women who created the worldwide smash stage hit-global producer Judy Craymer, writer Catherine Johnson and director Phyllida Lloyd-repeat their roles in bringing this joyful, musical story to the big screen. The Mamma Mia! film is produced by Judy Craymer and Gary Goetzman. Pierce Brosnan, Colin Firth, Stellan Skarsgard, Christine Baranski, Julie Walters, Amanda Seyfried and Dominic Cooper join Streep in this celebration of a mother, a daughter and three possible dads. 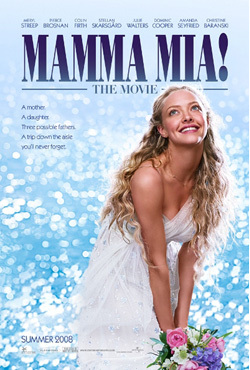 An independent, single mother who owns a small hotel on an idyllic Greek island, Donna (Streep) is about to let go of Sophie (Amanda Seyfried), the spirited daughter she's raised alone. For Sophie's wedding, Donna has invited her two lifelong best girlfriends-practical and no-nonsense Rosie (Julie Walters) and wealthy, multi-divorcee Tanya (Christine Baranski)-from her one-time backing band, Donna and the Dynamos. But Sophie has secretly invited three guests of her own. On a quest to find the identity of her father to walk her down the aisle, she brings back three men from Donna's past to the Mediterranean paradise they visited 20 years earlier. Over 24 chaotic, magical hours, new love will bloom and old romances will be rekindled on this lush island full of possibilities. Inspired by the storytelling magic of ABBA's songs from "Dancing Queen" and "S.O.S." to "Money, Money, Money" and "Take a Chance on Me," Mamma Mia! is a celebration of mothers and daughters, old friends and new family found. super filma. abbas dziesmas-lieliski. filma pozitīvāka nekā vaig. kur šo filmu var dabūt latviešu valodā??? man ļooti patika. tiešam ir skaista filma.